No, I did not, and dont plan to do so. The problem is not specific to FlightStick. On Win10 I tried to install Zadig for Flightaware Pro Stick, and that also failed, exactly same error for both. It is Windows10 which is rejecting installation of driver by Zadig. I have tried FlightStick, ProStick, and DVB-T on Win8, and zadig successfully installs driver, and no error messages are there. OK, wonder why it is accepted on some W10 systems and not others. which is found by accessing Settings >> System >> About. Please cross out the same information from your screenshot. When you run ZADIG, do you run it with Administrator rights? When you uninstalled the Flightstick thru Device Manger, you uninstalled both devices. HID Infrared Remote Receiver under Human Interface Devices and as a Realtek 2832U device under Sound, video and game controllers. When uninstalling, you checked off "Delete the driver software for this device"
If you device is displayed as a Bulk-In device" I would recommend deleting both devices it twice. Delete the Bulk-in, have Windows rediscover as HID Infrared Remote Receiver and Realtek 2832U ad then delete this two again. I had to do this step on my Surface. Please see attachment for info you requested. @abcd567 - can you run Windows update and bring you up to the latest build? 1709 is over a year old. When I made my last post, I have already realized that mine is 1709 & yours is 1809 :), and have already run updates thrice. Every time Win10 downloads few updates, run "restart", and the few downloaded updates are installed. Depending on how many updates behind you install has, I believe you might need a minimum amount of fixes applied before 1809 is installed. You might want to note the KB numbers being installed to verify that they are being applied and not some generated internal error isn't cancelling the install. The problem is NOT with FlightStick. The root case of problem is Windows 10. I concluded this after I tried 3 different dongles on Windows 10, and all 3 were showing driver problem. It is also NOT software problem. I tried AirNav, dump1090-win32, and rtl1090. None picked any of the above 3 dongles. 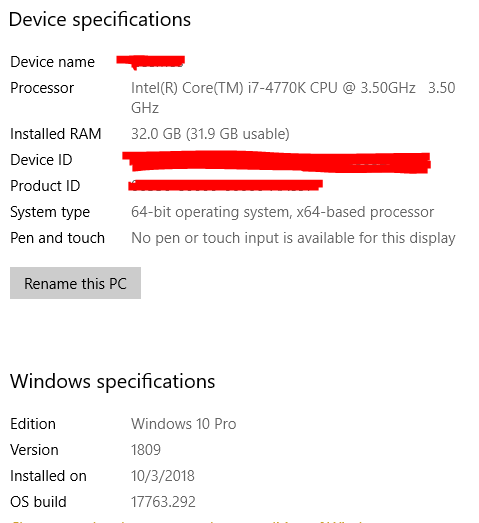 Source of problem is Windows10, and not any of the dongles or any of the softwares. Due to failure of Windows 10 to let dongle driver Zadig do its job, I have started using FlightStick on Raspberry Pi and feed RadarBox24 using linux feeder software "rbfeeder". The FlightStick is performing excellent with RPi. I also tried FlightStick on Ubuntu 18.01 on my PC, and FlightStick gave excellent performance, though I cannot feed RadarBox24 as they dont have linux x86 software (only arm for Pi). I however could feed Flightaware & Flightradar24 from Ubuntu 18 on x86 PC. I will have to disagree. While not the optimal solution to this problem, AirNav should have had a driver ready for the product, this isn't a Windows problem. I suggest that this is an issue with Zadig and its inability to install the driver or the copy of the WinUSB driver on your system. You proved this by not being able to utilize 3 different DVB-T type dongles, all that rely on the WinUSB generic driver. Windows is installing the driver for the chipset it sees, the Realtek 2832U chip. The drivers that everyone uses for SDR, in our case for ADS-B, is not exactly what the chip was designed to do. Windows installs the Realtek drivers, we are trying to substitute a generic driver in its place. If that driver is failing to load, then blame the driver. What I cannot understand is why some users cannot get the Zadig drivers to load. I have been using the Zadig drivers with my NooElec stick for some time and have not had any issues and all I had to do with the Flightstick was plug it in and away it went.